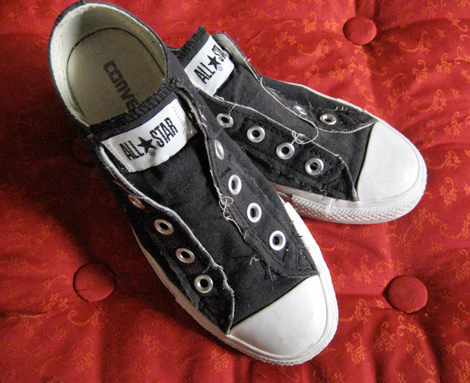 Mom says: A few posts ago, I ranted on about the fantastic and enduring design of Converse Chuck Taylor Allstar sneakers. 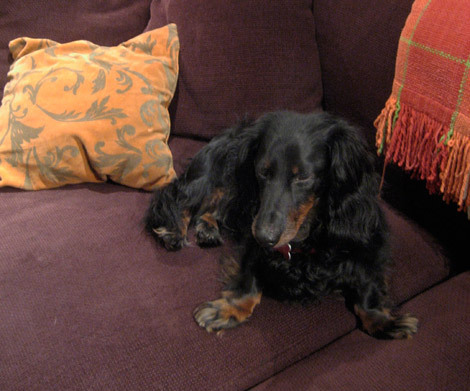 Here’s Molly, to talk about hers. 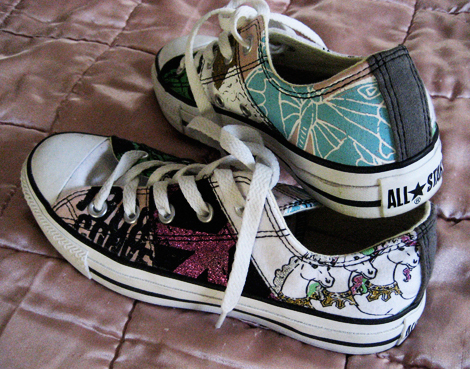 My mom LOVES her artistic chucks, but not nearly as much as I do! I am saving money to buy a new custom-made pair. 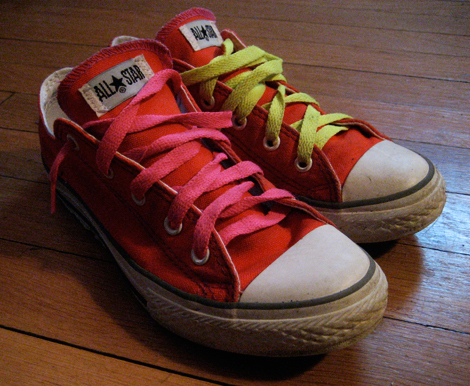 The amazing thing about the Converse web site is that you can design your own personal pair however you like. Pictured above: These happen to be my favorite pair of Chucks right now because I customized them with mismatched shoe laces. And also they’re orange! Mom says: It’s really cool when successful companies turn their customers into design partners… and it’s super smart marketing in today’s I-gotta-be-me world. Using a laptop for most of my work at designfarm, means that my projects travel home with me and this invites more opportunities to share what I do as a professional designer with my family. My daughter, Molly (age 11), has become particularly interested and engaged in all things design-related; discussing logos and book cover design with me when we get home from work and school and even (gasp) talking about being a designer. 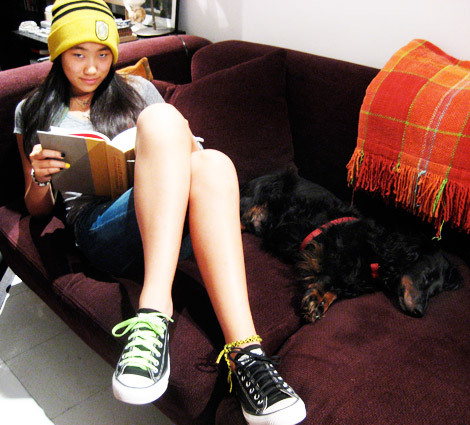 For now, Molly mainly needs to concentrate on being a sixth grader–grappling with linear functions, French vocabulary and science projects, among a zillion other things–but the kid just can’t help paying attention to and thinking about design. So I’d like to introduce a regular column (when Molly’s homework is done!) where she can share her ideas about design… the good, the not so good, and the sublime. Take it away MOLLY! 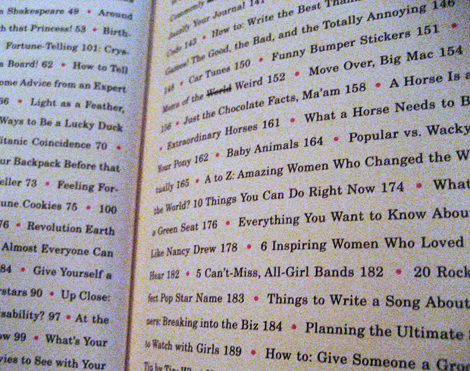 A table of contents is used to find any item/chapter in a book, right? 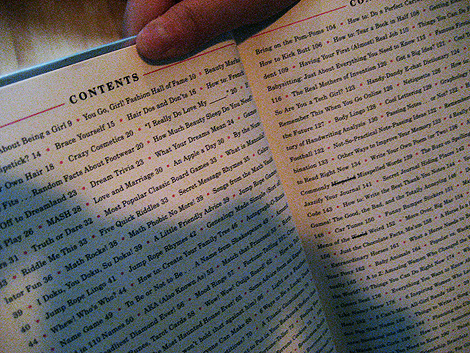 I can barely call this a table of contents. 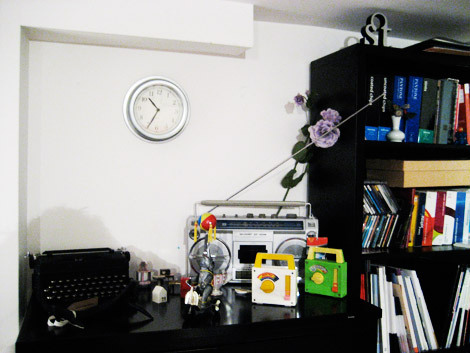 It was created sloppily and messily, I could hardly find what I needed, when I needed it! If you can find anything in it in under 5 minutes that’s amazing! Mom says: This is a kind of trendy/hipster treatment for a TOC, but what good is trendy if it doesn’t work? This is a classic example of form NOT following function. This took awhile to figure out the words. It’s not readable and is poorly designed! Complaint 1; the “N” isn’t understandable. 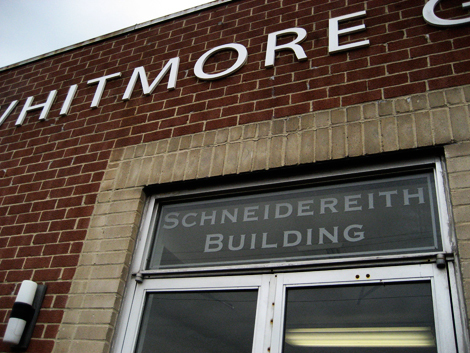 Complaint 2; the “G” looks out of order and sloppy. This doesn’t work because as an advertisement you would want people to buy from you, but if your ad isn’t readable then no one will know what or why you’re selling that item. Mom says: This isn’t a new concept (people as letter forms) but I’ve seen it done much more effectively. Perhaps this falls into the “too much of a good thing” category. One word built out of human characters would be plenty. Three words becomes… difficult. There’s also possibly a problem of scale. If this were a billboard you’d have a better chance at reading the words from a great distance. But who reads a magazine from more than a foot away? Molly and I hope you enjoy this column. If you are a school-age kid who thinks about design, drop us an email, we’ll write back! With the Blogosphere Christmas Police breathing down my neck for leaving my holiday lights up too long, I bring you the next post in our series: Pixels Are Everywhere. Sometime back, former staffer Sarah Ensminger posted about pixelated Army camo uniforms among other things that brought to mind the way designers have to think about images in these digitized times. This week, while we were iced in at home (no school! yippee! ), and as I was ruining my eyesight by cross stitching on black fabric I realized: Aha! Pixels again! These suckers are EVERYWHERE. More about cross stitching in a sec. 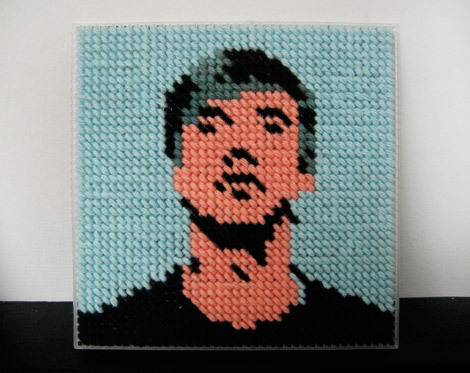 Above, one of my earliest and most cherished Etsy purchases, a series of needlepointed portraits by the ingenius artist, Tiny Rat. Look at the edges of the curves here… they’re crude, just like when a missing image file pixelates. Along with being visually brilliant and humorous, the kicker with these is the subversion of an artsy craftsy activity of yesteryear… needle-pointing with childishly hued chunky yarn on plastic. But instead of kittens we have fabulous fat dead drag queens, snarling punk rock superstars, and pop culture weirdos. I LOVE IT! Who is pictured here? You tell me! 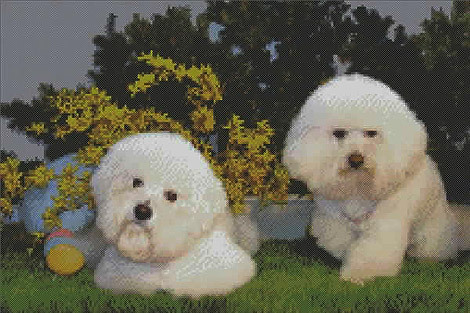 Here is one of my first cross stitch pieces, from a kit by another crafts genius, Julie Jackson of Subversive Crossstitch. I created this for my daughter Molly, who didn’t think it was nearly as funny as I did. Mooooooooom!!!! When Julie and I first connected we traded one of my custom charm bracelets for one of her subversive samplers. It’s too subversive for this blog, but you can see it at So Charmed by clicking on one our collaborative pieces. This close up will allow you to see the pixels. What’s really cool is that (duh!) depending upon how many squares to the inch make up your fabric, the image will enlarge or reduce accordingly. Whatever was done on Aida 14 (cross stitch jargon for fabric with 14 squares per inch) which is easy on your eyes. Fabric is also available in 11, which seems huge when you finish with it but is a good way to learn the craft. Again, it’s the subverting of this old, traditional, “women’s work” craft that really makes me smile. 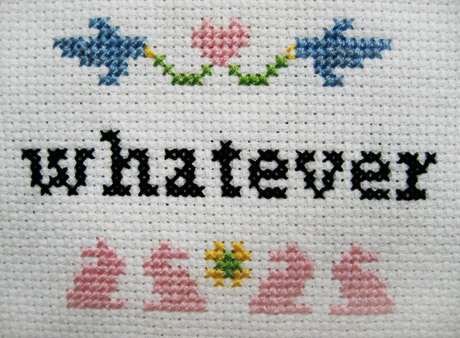 But make no mistake… like anything, cross stitch can get WAY (way) out of control. 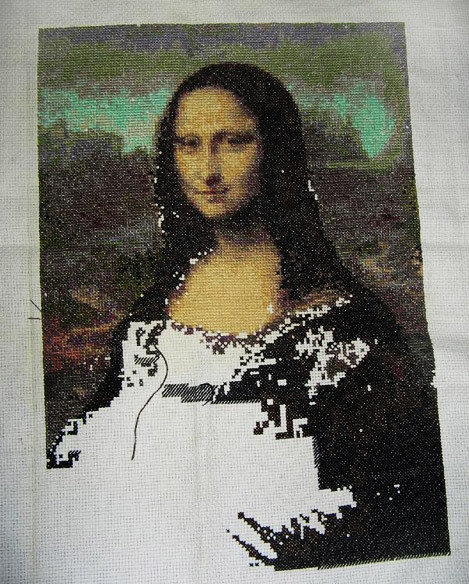 I love this partially completed Mona Lisa, which is, in a way, unintentionally subversive. What would Leonardo think? Probably not much! 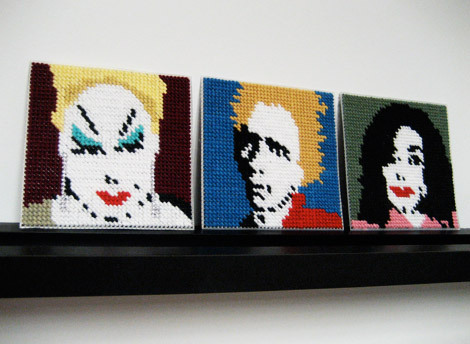 And, BTW, just to let you in on the insanity of this craft, we are discussing counted cross stitch. What this means is that the pattern is printed (see above) on a piece of graph paper and you are left facing a blank white piece of fabric with which you will be counting each and every itty bitty square as you stitch. So, it’s not as mindless as it seems. It’s actually pretty challenging. In a semi-mindless sort of way. Here is one of my works-in-progress. 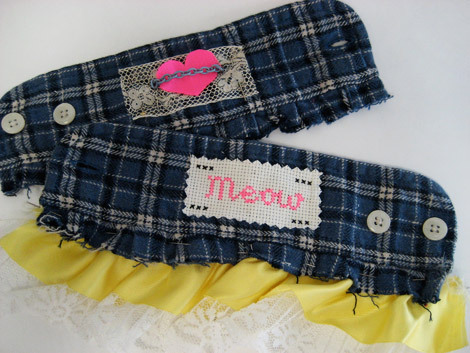 I’m using cross stitch on little pairs of mismatched cuffs created from reclaimed men’s shirts… adding lots of lacy goodness and other crap Jodi-ish embellishments. I’m selling these cuffs at So Charmed and Courtney Love Cobain bought one of the first pairs! 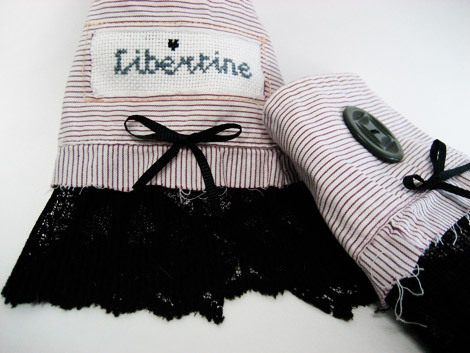 Here is a finished pair… I love the juxtoposition of the oxford shirt fabric with frilly ventian lace. 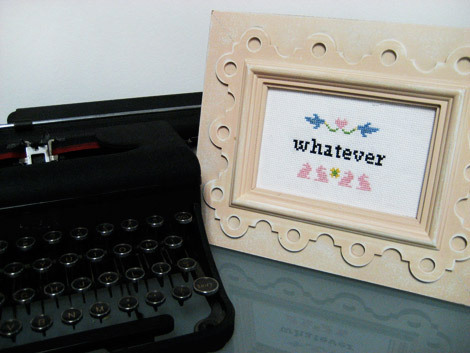 Cross stitch alphabets come in all kinds of crazy fonts too, including lots of sans faces, Celtic-influenced calligraphy, and super fussy monogram styles. Alphabets, and other patterns are often available free on the Internet. 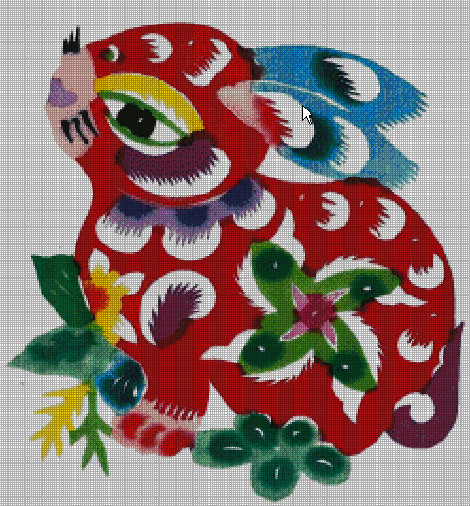 I’ll leave you pondering Stitching with Pixels with one last Tiny Rat piece (really, you MUST visit her shop). In this case, there’s perhaps less subversion… I think Andy Warhol would have absolutely LOVED this, don’t you? File this post under Great design never goes out of style, but more importantly, under How a seemingly unrelated object from the world we live in makes its way into our professional design lives. A perfect example of how cultural phenomena in sports, fashion, music and yes, even graphic design, can converge in an effective and meaningful way. But first, some back story. Waaaay back. The history of the shoe pictured above (my red hightops) is a history of 20th century America; too long to document in this post. 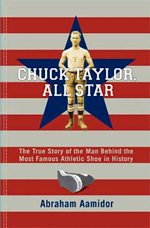 Briefly, Converse rubber-soled All-Stars basketball shoe was first produced in 1917 and quickly made famous by the brand’s namesake, Hoosier player Charles Taylor who became the shoe’s best salesman/evangelist. Other highlights on the shoe’s resumé include: 1939 | The fist NCAA championship basketball tournament was held. Both teams wore Converse All Stars, 1950’s | The shoe becomes popular with rockabilly fans and other music subculture types, 1970’s | The Ramones popularize the shoe for punk rockers and teenage girls wear them in high school hallways all over America (back then mine cost under $20 and my daughter Molly age 10 just bought her first pair), 1990’s | Another music-related resurgence of the retro style within Seattle’s grunge culture and, 2000’s | Spotted on fashion models, hipsters, in music videos, and all over the streets of most major cities worldwide. You just can’t keep this shoe down! So. 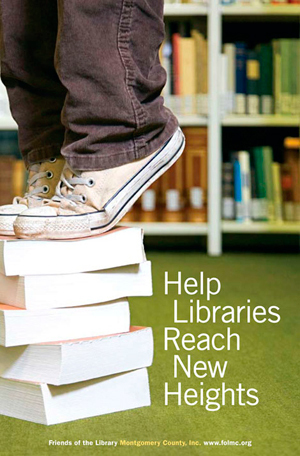 When we located the image pictured left for a Friends of the Library membership development brochure design, I rewrote the publication’s title in order to employ the image most effectively. As can happen, the combination of a great image and a great headline is often too tempting to resist. This became the winning comp in the series. I’m happy to announce that the brochure delivered yesterday and they are gorgeous. 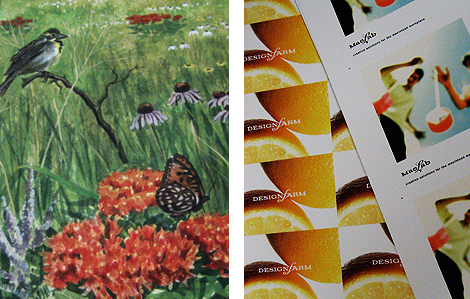 From the client: “Our brochures are phenomenal, and I mean phenomenal! From me: YAY!!!! And, HOW FUN! I will also occasionally fall hard for something as utterly silly as those pictured above. I love ‘em but something tells me that glittery unicorns is not quite what hoops-star Charles Taylor had in mind back in 1917. 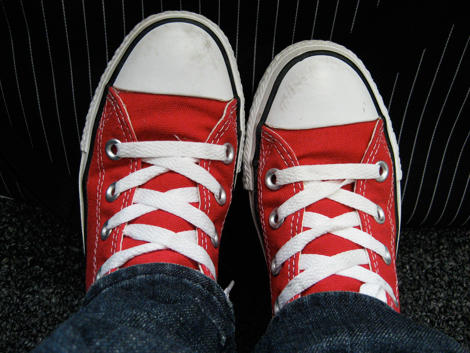 Do you have a favorite pair of Chucks? Send us a photo and we’ll do a recap of this post. Want to join the club? Visit zappos.com to find pages and pages of styles in many fabrics, colors, and prints, including collaborations with major designers such as Ed Hardy and John Varvatos. Jodi’s shopping tip for you women out there… raid the kids department for $AVING$. With all of this blogging lately about color it’s time for me to introduce you to one of the designer’s most primary and useful tools-of-the-trade, and explain why clients too should consider owning at least a portion of the Pantone guides to color. 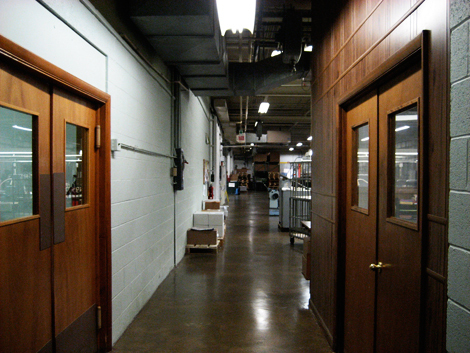 First, a few general lessons about color. Did you know that color is not really absolute? We all think we know what we’re talking about when we say “red,” but beyond the fact that there are zillions of hues of red, our eyes might see (and our brains might perceive) these hues differently. Some of this is physiological and psychological, to be sure, but even simple and absolute things like lighting (which can be cool or warm), context (ie, what color surrounds the red?) 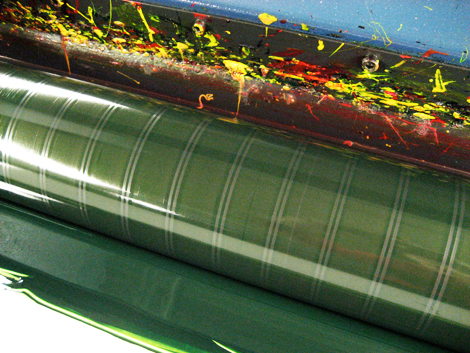 and material or substrate (is the color printed on shiny coated paper, being viewed on a computer, a piece of fabric? )… will have a PROFOUND affect on our perception of that color. This complex and tricky situation–essentially, controlling color perception among those who are concerned with it–is Pantone‘s raison d’etre. 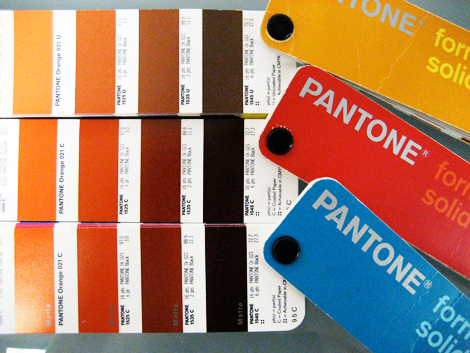 In every professional creative field, from specifying color for graphic design, such as brochures, Web sites, etc., to fashion and interiors, Pantone provides a printed set of standards that help us discuss and actually perceive color in a more consistent way. 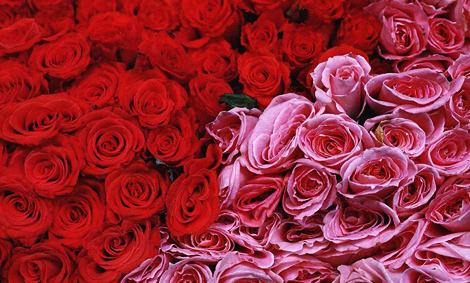 So that maybe, une rose est une rose est une rose. In today’s cost-conscious, digital world, we designers are producing fewer and fewer color proofs of our work for clients, saving time and money, and opting instead to email pdf’s that for viewing on monitors. Monitors, which are variously calibrated and reproduce color in a special and different way (RGB, or Red, Green, Blue) is a subject for a whole other post. For now, just trust me… your monitor is not a safe way to view color for print. 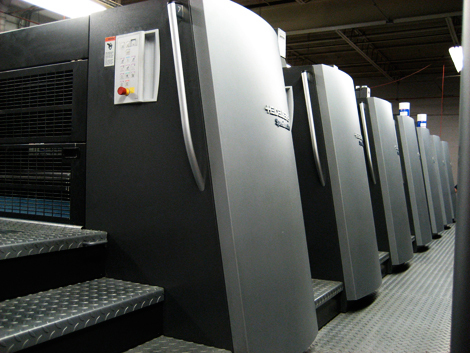 Along with proofing by pdf, we are also buying and managing far less printing on behalf of our clients; clients are opting to navigate this hugely complicated terrain on their own in an effort to keep costs internal. 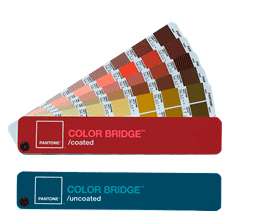 For all of these reasons, please (please, please) consider buying the Pantone Color Bridge Set. At $179, it’s not cheap, but will save you piles of money on ibuprofen alone. 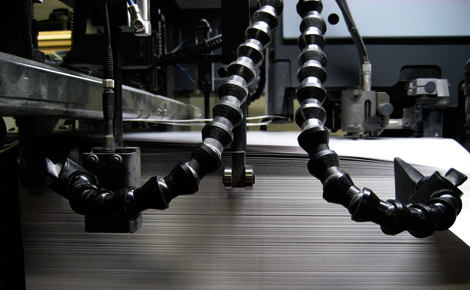 It may also save you thousands of dollars in print materials that turn out differently than you expected because you viewed a pdf of your company brochure on your monitor. Let’s dig in to this, shall we? I suggest a cup of coffee. Ok, ready? I know that you are! 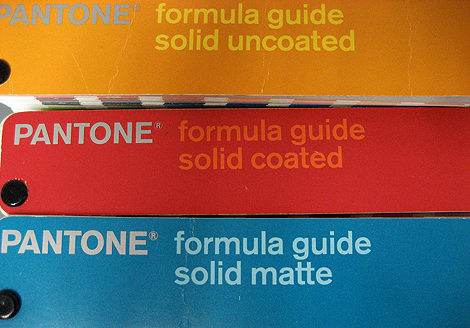 Pictured above is a complete set of Pantone guides that we bought in 2000, admittedly lightyears ago in terms of our industry. This set probably should have been replaced because of color fading alone, but having kept ours undercover they remain in like-new condition. For most clients, the entire set of these (over $500) is way more than you’ll need, but if your company can afford it, I’d recommend the whole shebang (the CURRENT set, not the slightly outdated one we own). Explanations of these tools follow. The 3 guides above represent the complete Pantone Matching System, commonly referred to as PMS. Your organization probably has corporate PMS colors and possibly even an expanded palette of same… part of the graphic standards (along with fonts or templates perhaps) developed by a professional designer (we hope) to keep your materials consistent and cohesive among outside and inhouse designers alike. 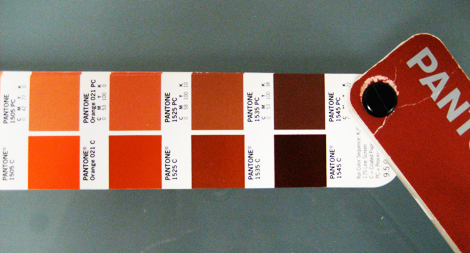 PMS colors are PRE-MIXED INK FORMULAS. Think of paint that you buy for your walls or home… these colors are professionally mixed in controlled environments, and when specified for your brochure, can be counted upon to be relatively absolute. The books above fan out to show you the full range of these available SOLID colors, printed on uncoated, coated (shiny), and matte (coated, but dull) papers. Why? Because these substrates profoundly change the way many PMS formulas will appear. You can see this illustrated below; I have the three books open to the same page. 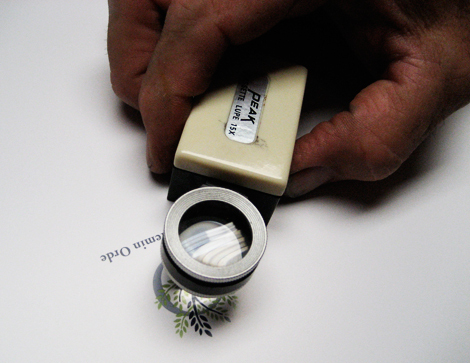 The difference between uncoated and coated (either shiny or matte) is particularly apparent. The reason to own this set of books is so that you and your designers can discuss PMS colors, and even paper specifications to some extent, while viewing these things in the same context (remembering again that the colors will shift in sunlight, warm or cool fluorescents, etc…). So when we say: We are thinking about PMS 265 for your logo… you can look that up in your book and say: Oh, I like that very much! 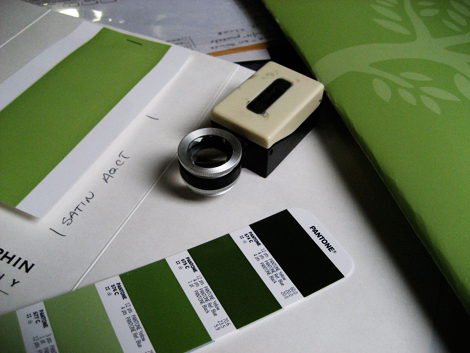 Remember, we can NOT show you what a PMS color will look like by printing on our sophisticated studio inkjet printers. These printers use CMYK to print color, not premixed inks. If the studio inkjets used the actual PMS inks, we’d have thousands and thousands of cartridges (one for each of those 6,000 colors!) residing here in the studio. Obviously not feasible. Let’s explain further. 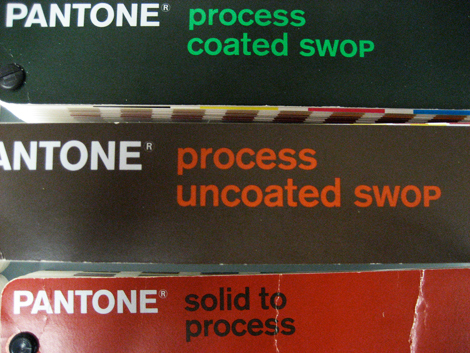 Pictured above, the Pantone Process Coated and Uncoated (same substrate issue) and the Solid to Process guides. Let’s tackle process first and then the whole solid-to-process conversion ordeal (about which, there is some shocking news! A virtual cliffhanger if you will). 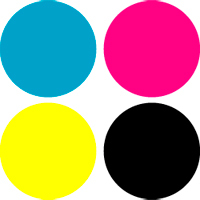 Process refers to printing in CMYK, which stands for Cyan (blue), Magenta (hot pink), Yellow (yellow) and Key (Black). This is the printing process used for all materials that contain color photos; essentially a pattern of dots in varying percentages of all or some of these FOUR COLORS will make up every hue seen on the printed piece. To the naked eye, the dots blend smoothly together, looking under a magnifying glass or “loop” will show you the pattern of dots. 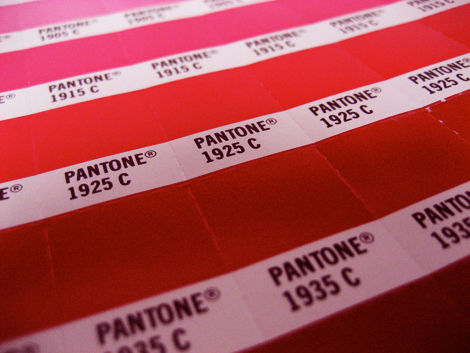 Sometimes, process printing is combined with Pantone printing… a company may have a budget for a 5 (instead of 4) color job, so that their corporate color (PMS 265) remains absolute. But, if budget doesn’t allow for the addition of this 5th color, we will be converting your PMS color to its CMYK equivalent. And that’s where things get tricky. The first two books pictured above show you JUST a selection of CMYK process colors. Because the combinations are close to infinite, even the thousands of builds shown can be frustratingly limited for us. Still, if we stick to one of these, we can talk to our printers and our clients in the same absolute color language. 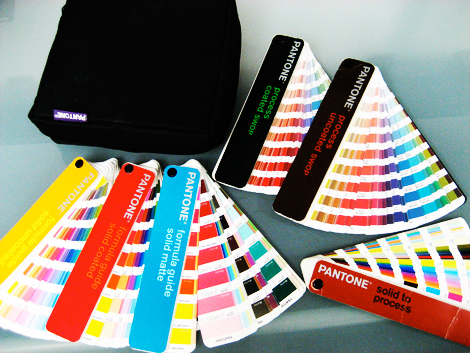 The last book, solid to process, shows the conversions from Pantone or PMS to CMYK, side by side. In the photo below, the PMS or PREMIXED pantone color is in the bottom row. In the top row is Pantone’s best effort at replicating that color in CMYK process. Or is it? READ ON, my friends. And, prepare to be shocked. In what can only be called hugely scandalous, Pantone has CHANGED the CMYK builds, unbeknownst to me until the very morning of this writing. Let me say that again… Pantone has CHANGED the CMYK builds!!! A client, having just this week taken my advice to purchase the NEW Pantone Bridge guides, pointed this out while we were discussing colors. And boy, was my face RED! PMS 032 Red, for those in the know. So, if you own the Solid to Process book, THROW IT AWAY and purchase the Bridge, pictured below. If you own nothing at all, purchase the Bridge, pictured below. Mine is on order! Here’s what you’ll get and really, it is all a non-designer needs: The same presentation format as the Solid to Process guide, but (heretofor unpublished) on BOTH coated AND uncoated paper. And, most importantly, with Pantone’s revised, updated, new and improved conversions that promise to be a closer match between PMS and Process. Whoooohooooooo! Get it? If not, don’t worry… this is the stuff of big headaches, for sure. Just go back to the beginning of this endless (but hopefully not pointless) post and read all of this again. Or call me, I’ll try to help. 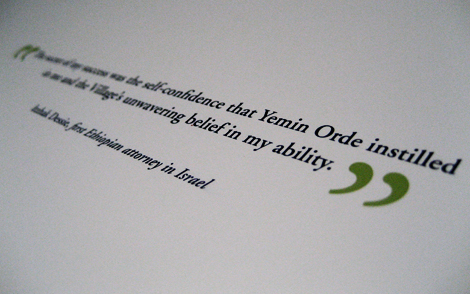 Because an educated client really makes the best partner for brilliant design and printing results. 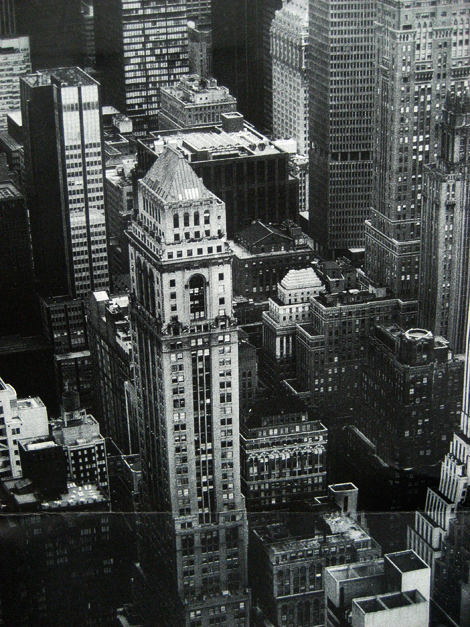 I took this amazing photo of NYC from my hotel room window the last time I was there. I printed it in my darkroom at home. I’ve got photography skills, don’t you think? 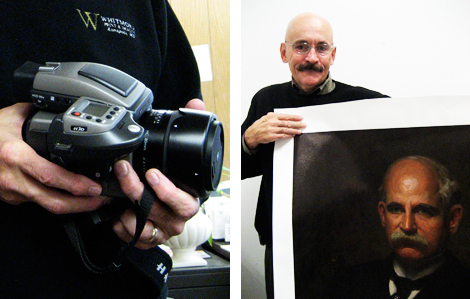 Oops, what is that… um, crease along the bottom? Well…. 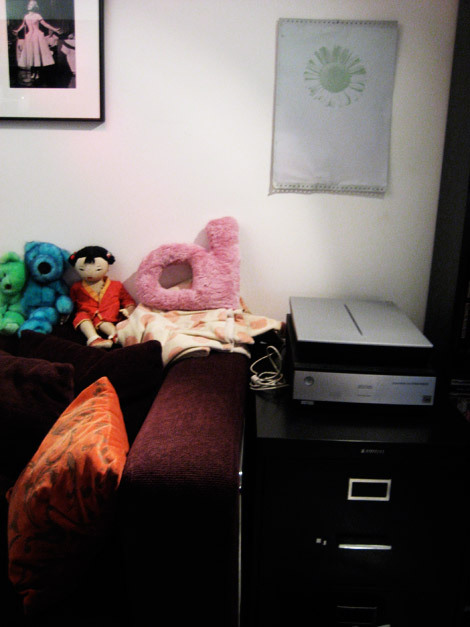 umm, uhh, I wasn’t showing you the whole lovely print I made in my darkroom at home, because, well, my 10-year-old folded it along the bottom so I cropped that part out. Yep, that’s what happened. Oh no, I’m caught in the act. 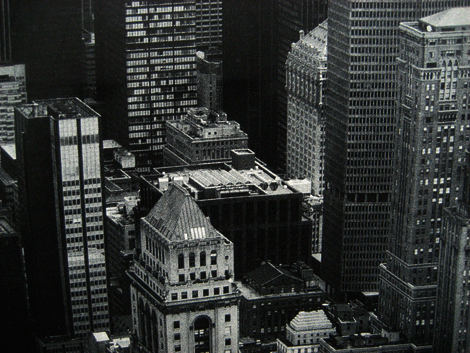 I didn’t take a photograph of New York City after all… and my 10-year-old is exonerated. In fact, here’s the reality. 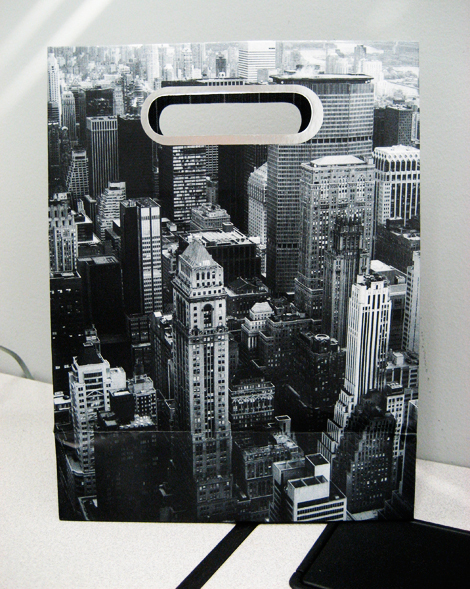 The “photo of NYC” is actually just a super tight crop, a close-up of a part of a cute little gift bag that sits on my desk here at the office. 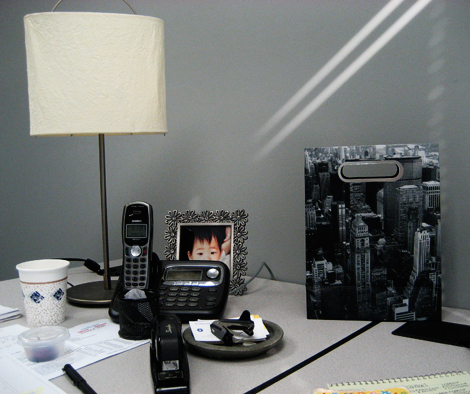 The reason I love this bag and the reason it occupies valuable real estate on my desk, is because I can (mentally!) dive into the image, as shown at the very top of this post, and feel like I’m there… I can zoom in with my mind’s eye, eliminating the surrounding clutter… and travel. I heart NY. I can also demonstrate what’s possible with cropping, a tool in every designer’s bag of tricks, and something we do by second nature after a certain number of years. A practicing designer begins to really see the world differently and can then manipulate your perception as well. Verrrrry powerful stuff. Thankfully, most of us (your friends at designfarm, included) operate in service of good vs. evil. 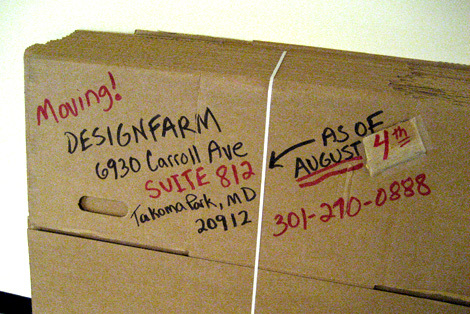 It’s official, we are happily relocated on the 8th floor of the Takoma Business Center! Info appears above with new stuff in RED. I know what a pain it is to ask you to update your files, and I appreciate you doing so. 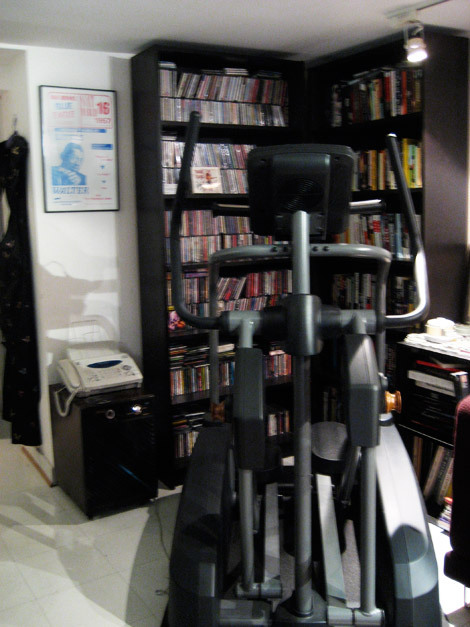 By the way, the drawing pictured above is the one I used in order to solve the problems of moving. It’s hard to see that it’s done on graph paper… 1/4 inch square = 1 foot. Because three dimensional design is super challenging for me, I’ve employed this technique for 3 moves now, at the office and at home. And it really works! I highly recommend this for anyone… whether you are design-minded… or (especially) if you are not. For the office move I had the space planner’s scale drawing to work with. Unfortunately, it really was not done very accurately, which caused problems. 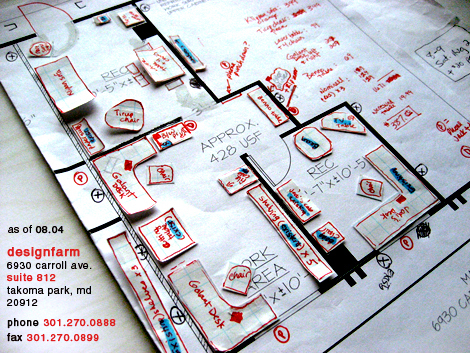 For two home moves, I’ve measured the rooms myself, and it worked out far better. 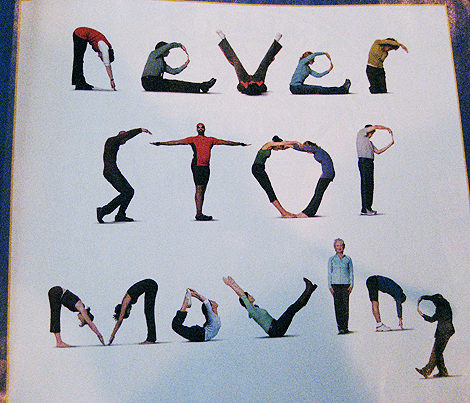 If you’re moving, or even planning a new room, give this technique a try. Mark the windows and doors on your drawing and then measure existing furniture you think you want to include… and any new furniture you’re considering buying. Cut the furniture out of the same graph paper and put double stick tape on the back. Then… play! In many situations, the best plan will quickly present itself. I recommend you ask another person to also work with you, both on paper and in real life when the move occurs. In two instances, I’ve had the help of friends and colleagues who brought a different (and ultimately, better) eye to the process. There will always be things you’ll change. 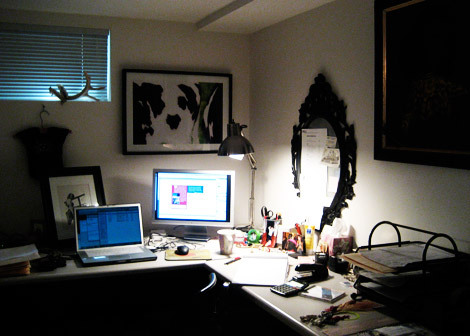 What looks good on paper may not have the right feng shui in real life. But it will definitely give you a solid start, and will help you as you plan what to take, what to buy, and what to leave behind. 7.22.08 Not Yet… but Soon! You wouldn’t think that moving from the 7th floor of a building to the 8th would be a big deal, would you? Well then… you haven’t been a busy design practice with a bunch of gotta-save-everything designers on staff. Collectors. Catalogers. Archivers. Designers! The good news is: Minimal change to our address… just a new suite: SUITE 812. New phone number (not yet confirmed) is easy to remember… a bunch of 8’s: 301-270-0888.